The brainchild of writer-director Drew Goddard (2012’s post-modern horror game-changer “The Cabin in the Woods”), “Bad Times at the El Royale” is a deconstruction of film noir tropes and a savvily constructed character mosaic with a wounded humanity. Not unlike his feature debut where a bevy of slasher-movie characters in a cabin in the woods were intentionally archetypes and part of a bigger endgame, Goddard’s seven disparate strangers are all familiar types with more than they let on and become part of a grander scheme involving greed and voyeuristic surveillance. 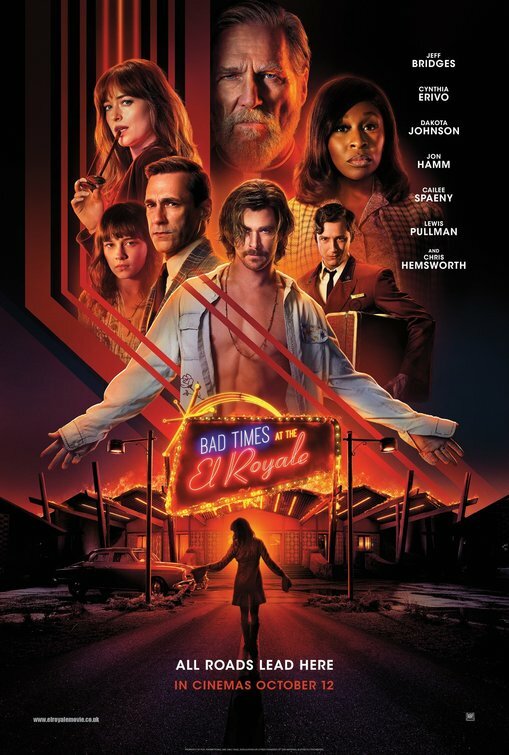 “Bad Times at the El Royale” has Agatha Christie and Quentin Tarantino vibes, along with basic similarities to 1995's "Four Rooms" and 2003’s “Identity,” but even being only his second film, it’s all Goddard’s own creation, brought to stylish life with every department firing on all cylinders, from a star-studded ensemble that’s terrific across the board, to beautifully orchestrated cinematography, pitch-perfect musical choices out of a jukebox, and production design that offers vibrant color, detail and texture. One is recommended to just let this tantalizing neo-noir take them along for the ride. The El Royale is Lake Tahoe’s best-kept secret, a once-famed hotel resort straddling the California-Nevada border. It’s 1969, ten years after a bag of cash is hidden underneath the floor in one of the rooms, and motor-mouthed vacuum salesman Laramie Seymour Sullivan (Jon Hamm), priest Father David Flynn (Jeff Bridges), and struggling lounge singer Darlene Sweet (Cynthia Erivo) all check into the vacant bi-state establishment for a room. Miles Miller (Lewis Pullman) is the hotel concierge stuck with managing the El Royale. Just before the three guests go to their rooms, the mysterious, no-nonsense Emily Summerspring (Dakota Johnson) zooms into the parking lot, looking for a vacancy. After everyone’s secret is laid out through a corridor of two-way mirrors in every room and a sixth party, Rose (Cailee Spaeny), is revealed to be with one of the other guests, a seventh stranger is about to descend upon the El Royale and force things to head even more south. Set against the late-‘60s backdrop of the Vietnam War and the Richard Nixon presidency, along with a TV news bulletin reporting a cult-like double homicide, “Bad Times at the El Royale” doesn’t waste a second setting up a locked-room mystery of sorts with precision. In a thickening puzzle-box narrative, the film corkscrews through each character’s perspective and individual anecdotes with chapter headings (all are named after a room number and a maintenance closet), snapping into focus who each of them really are and what they want. From the nearly silent prologue with a stranger (Nick Offerman) going to great lengths to hide the McGuffin-y bag of money in one of the hotel rooms, director Drew Goddard sets an example for the expert visual storytelling that continues for the film’s entire 141 minutes. His deliberate, slow-burn pacing is essential in putting an intoxicating spell on the viewer and making the viewing experience of seeing how and when the pieces will click into place that much more engrossing. With such a large ensemble assembled, it becomes a treat to watch all of these faultlessly cast actors get a chance to shine with the shape-shifting duality their roles call for. Accomplished Broadway star Cynthia Erivo (2016 Tony Award winner for “The Color Purple” and one Oscar away from an EGOT) makes her sensational film debut here as the cautious and strong-willed Darlene Sweet, affirming herself as a magnetic, versatile talent of whom audiences are bound to see more. Darlene is undeniably the heart and moral center, particularly when given a scathing, stand-up-and-cheer primal scream of a monologue to deliver with a firm tenderness, and Erivo gets to use her voice of an angel to perform The Isley Brothers’ “This Old Heart of Mine” that serves organic purpose to the story. As the suspicious Father David Flynn with a failing memory, Jeff Bridges shifts between sympathetic and duplicitous, and his one-on-one scenes with Erivo are some of the film’s most poignant. Under the façade of a salesman who won’t shut up, Jon Hamm brings comedic bravado and makes his moments count. Coming in hot as an enigma with a chip on her shoulder and a body in her trunk, Dakota Johnson (2018’s “Fifty Shades Freed”) lands deadpan laughs and then sheds some vulnerable layers once her motives become more clear as Emily Summerspring. Lewis Pullman (2018’s “The Strangers: Prey at Night”) is another standout as Miles, a troubled soul in need of a confession and still reeling from a past riddled with guilt. Like a proverbial party crasher, Chris Hemsworth makes his wildcard turn as hippie cult leader Billy Lee alternately dangerous, seductively charismatic, and hilariously offbeat, and while his role is comparatively small, he makes quite the impression and not only because he gets to gyrate to Deep Purple’s “Hush” with his open shirt exposing his abs. 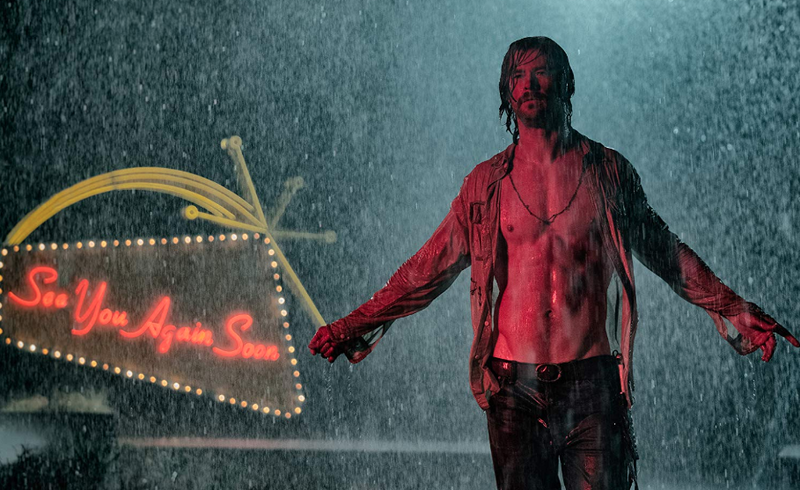 The pleasurable thrill of watching “Bad Times at the El Royale” is not knowing where the story is headed with all of these richly layered characters who are never what they seem, but to paraphrase Ralph Waldo Emerson, it is about the journey, not the destination. Rather than being played as a thriller with so many rug-pulling tricks up its sleeve that makes one scrutinize everything that came before, it reveals itself to be a collision of these strangers’ lives in a state of flux. By the end, the payoff might not amount to a big revelation, but once Billy Lee gets thrown into the mix like a match hovering over gasoline, the final confrontation is chilling, with an unbearably tense deadly game of Russian roulette, and then explosively violent. Above all, the characters left standing get the ending they deserve. 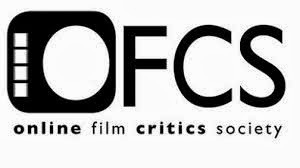 Without being a reboot, a sequel, or based on a pre-existing property but taking superficially familiar ingredients to concoct an original whole, “Bad Times at the El Royale” crackles and pops as an audaciously sprawling genre exercise, a revolving door of juggled tones and a looking-glass world that keeps changing and surprising. 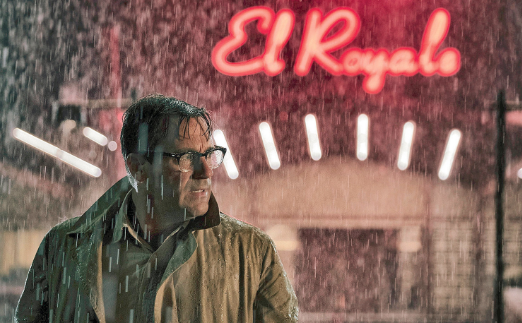 Darkly funny, delectably unpredictable, and ultimately humane, the film is actually a very good time at the El Royale.